Il calendario di concerti e iniziative non ne risentirà, ed è anzi tutto pronto per riprendere regolarmente da martedì prossimo al nuovo indirizzo di 55 West 13th Street. Tuttavia oggi è un giorno cruciale per il locale newyorkese The Stone, fondato tredici anni fa da John Zorn, con l'ultimo concerto nella storica sede tra Avenue C e 2nd Street. Auguri! Scrive Bruce Lee Gallanter di Downtown Music Gallery: "The final week of downtown-style improvisations at the old Stone has been a blast every night, playing to a packed room and blowing minds! Please come down before the old Stone closes and becomes history, raise your glass of spirits and give a toast to the Stone founder: John Zorn! 13 years, more than four thousand nights of live creative music performances! Beginning next Tuesday, February 27th, the new Stone at the New School start its weekly schedule of five nights, Tuesday-Saturday, so come on down! 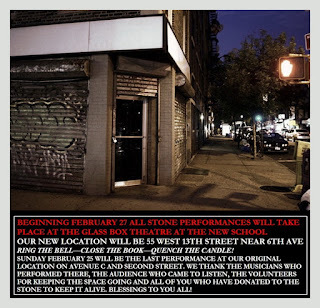 Long live the Stone, old and new, the home for creative music in NYC!" E questo l'annuncio dello stesso Zorn: "Beginning February 27 all Stone performances will take place at the Glass Box theatre at the New School. Our new location will be 55 West 13th Street near 6th Ave. Ring the bell, close the book, quench the candle! Sunday February 25 will be the last performance at our original location on Avenue C and Second Street. We thank the musicians who performed there, the audience who came to listen, the volunteers for keeping the space going and all of you who have donated to the Stone to keep it alive. Blessings to you all!"